How Much For Underfloor Heating? Underfloor heating is a luxurious alternative to conventional radiators, best of all it can be installed under almost any type of flooring: Stone, wood, tiles or even carpets. This space saving heating system can bring an unrivalled level of warm comfort to your home. These systems are cheaper, easier to install, and suitable for DIY. You should expect the running cost of this underfloor heating system to be higher. Installation of these systems is a lot more involved, usually reserved for new-builds. Since they tap into existing boiler systems they cost significantly less to run. The total cost of installing underfloor heating will be dependent on the size of your house/room, system type and groundwork required. How Does Electric Underfloor Heating Work? Electric underfloor heating systems use a network of electrical wires running under the surface. They warm the floor but do not heat the room efficiently. Electric systems are commonly installed in smaller areas or rooms, such as bathrooms. Different models of electric underfloor heating systems may be chosen. Flexible wire systems are ideal for tight spaces, cable systems can cover larger areas more easily, and then heating mats are the easiest to install. Before installing electric underfloor heating, you must take up the existing flooring and level with a screed layer. 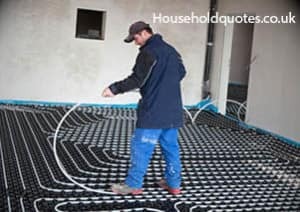 Insulation should also be placed before heating sheets/cables are laid to enhance the efficiency. You may require assistance from a qualified electrician to locate and tap into the mains supply. A full system will require a sensor, thermostat and control panel to keep control of heat levels. How Does Water Underfloor Heating Work? Wet underfloor heating systems can also work with different types of flooring. However, their installation is a lot much more involved and costly. They are best suited to larger areas or entire homes since the system dissipates heat very well. Water underfloor heating uses a network of pipes to run hot water from a boiler. The pipes radiate heat through the floor and into the room. You may even choose to connect your system to a solar heater or ground source heat pump for increased efficiency. These wet underfloor heating systems are far more efficient than conventional radiators. Wet systems are ideally suited to new-build homes. They require extensive piping around the room, through a manifold and back into your central heating system. An independent thermostat also needs to be installed to further regulate temperature control. You need to allow more space for these systems, digging deeper or elevating the ground if retrofitting. Pipework and insulation needs to be completely level. These adjustments are often too difficult and costly to justify for existing homes. Lower profile systems can make it a little easier to retrofit but the system costs will be even greater. Wet systems are not DIY friendly. Installing them will certainly require assistance from a number of professional tradesmen. With such vital plumbing connections, proper testing needs to be carried out, it’s simply not worth chancing it. Consult a local heating engineer or underfloor heating specialist to advise you before proceeding. A professional survey will help you select the best underfloor heating for your home. Your boiler will also need to be tested to ensure it can support this additional heating system. Get FREE Underfloor Heating Quotes Today! How Much Does Underfloor Heating Cost to Run? Electric underfloor heating costs are higher than water heating systems. Electric systems do a great job at warming the floor but not the entire room. With small rooms such as a bathroom, you should expect a small increase in your electricity bill. Electric underfloor heating systems cost just under 10p per metre squared, when ran for 6 hours. An average bathroom of 3.5 metres squared may cost around £10.50 per month to run. Wet underfloor heating systems hook up to existing boilers, replacing the need for radiators. Since underfloor systems are superior at circulating the heat, lower water temperatures can be used. Where radiator system may require water around 70°c – 90°c, a wet underfloor heating system can perform at only 50°c. As a result, you can expect to make a decent saving on your heating bills. How Much to Install Underfloor Heating? Underfloor heating installation costs subject to area and complexity of the system. All systems require you to remove the floor, lay the system, tap into a power source, and fit sensors/controls. Electric systems are much less hassle and a preferred choice for retrofits. They have a slimmer profile plus they don’t require extensive pipework. Expect the cost of underfloor heating per m2 to be around £50-£75 when using electric heat mats. Cost may vary depending on insulation, heater controls, and electrician fees. Wet underfloor heating systems can cost way into the thousands. Expect whole system installations to cost £2,000+. Typical day rates for professional installation are £300 per day. It’s likely you will receive quotes of around £100 per square metre. The underfloor heating installation cost may rise depending on the distance from the boiler system and extra piping required. How Much is Underfloor Heating DIY? With electric systems, heat mats are the simplest choice. DIY underfloor heating cost per m2 is only around £20-50, depending on the size of the area. Additional costs for heater controls, screed and insulation boards may need to be taken into consideration. Expect to pay around £100+. You may still need a professional electrician to hook the power up to your system, consider their labour rate of around £30 per hour. If you don’t know anyone local you can often get 3 free quotes from Rated People. For a typical bathroom, DIY electric underfloor heating cost can be kept under £500. DIY wet underfloor heating kits are also available if you are feeling brave. Full kits cost around £500+ including pump, valves, thermostats and enough pipework for 20 square metres. If you were completing most of the work yourself it may be possible to keep costs under £1000. Just remember, it’s a large undertaking and will require extensive groundwork. Consider at least consulting a heating engineer and plumber to ensure your planning and work is up to scratch!